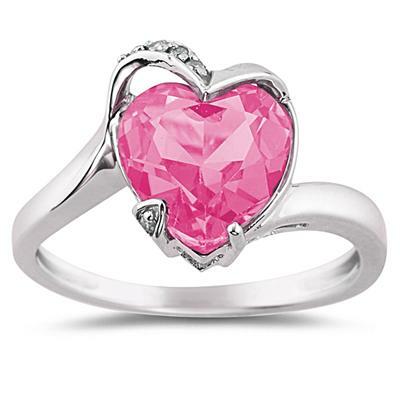 True love sparkles in this gorgeous gemstone ring. A single heart-shaped pink topaz stone brings a rosy glimmer and measures 10mm by 10mm, making this heart is hard to miss. The bold beauty of the heart shape is surrounded by a 14K white gold setting that delicately swoops around the gem. The setting also features five brilliant white diamonds that add to the ring's special shine. The elegant setting seamlessly flows in the white gold band which beautifully supports the precious gems and make this a flawless display of love. We guarantee our Heart Shaped Pink Topaz and Diamond Ring in 14K White Gold to be high quality, authentic jewelry, as described above.